1891 OS 1:500 Town Plan. 1891 OS 1:500 Town Plan. 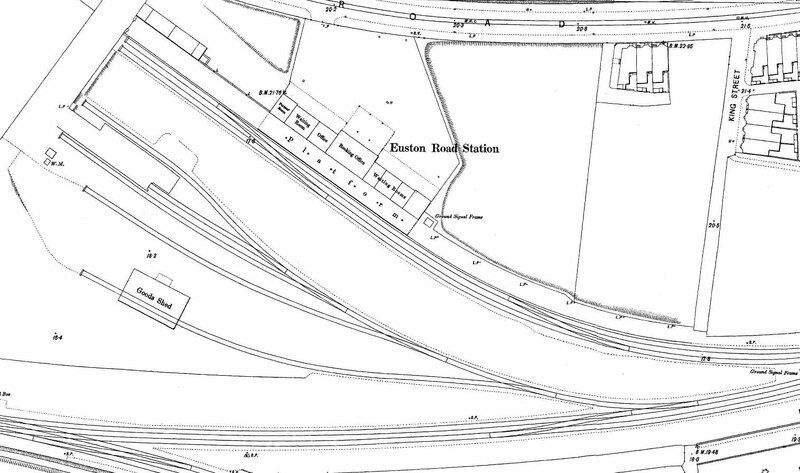 Although this Town Plan is dated 1891 trhat was the publication date but the survey was earlier as it shows thed station as built with only one platform. The two buildings at the north end of the platform are the gents' and ladsies toilets; an unusually large block to cater for the huge numbers passing through the station during a summer weekend. The rooms in the main station building are, from left to right, porters' roon, waiting roon, office, booking office and four waiting rooms. At this time the station didn;r have a signal box with points being controlled from a ground frame at the east end of the station building. The goods yard has five sidings serving a cattle dock near the entrance toi the yard with a weighbridge alongside. The southern siding passes thorugh a large goods shed.